First and foremost let's get one thing out of the way - I've never eaten red velvet cake prior to this one. The amount of food coloring in it gives me the heebie-jeebies and I wasn't sure if I ever want to dig into a piece of cake that looks like it has gone to war and back. In fact I posted this on my Facebook exactly a year ago going "Red velvet cake freaks me out. Why make something chocolate red?!" The fact that the red in the cake can't actually come from any natural chemical reaction set me even further apart from this American classic. Needless to say I stopped giving it much thought after that till recently, when my good friend Najah's birthday was around the corner and I realized (in a state of panic while I was still in Hong Kong for work) I hadn't gotten her anything. See, last year I baked her this humongous tower of chocolate goodness as a present and not only did she go head over heals at it with her fork, she proceeded to make the cake more than a couple of times. This year I wasn't sure how to trump that and since the domestic goddess in her already resulted in a very well equipped kitchen, I couldn't just lift something off the shelves of ToTT for her and call it a day. By the time I was back in Singapore, she was already celebrating her sixth wedding anniversary so that meant only one thing - I have to bake her another cake she'd love - which also meant I have to make my peace with the red velvet, her recent favorite. So out I went to get two bottles of red gel coloring - just in case one wasn't not enough - I've learned to get backup ingredients when I'm baking to deadlines. Since we're both chocoholics I settled on Deb's recipe, the only one I've come across using more than a few tablespoons of cocoa. The possible inaccurate assumption that more is more didn't occur to me as I was convinced that half a cup of cocoa against 3 1/2 cups flour wins over the typical two tablespoons against 2 1/2 cups. Aiming to please, I had an urge to build a stacked cake with four corners instead of the boring round, especially after seeing this piece of art. And while we're at it, I thought why not up the ante and swap some of the cream cheese in the frosting with some mascarpone? I know some purist out there (no offense to any Southern readers from the States reading this) would shake your finger at me going "Cream cheese? Cream cheese?! Girl, haven't you heard of my mother's cooked frosting?" Well, I have. It's just that while we're at it with half a cup of Dutched cocoa instead of the traditional meager-why-bother two tablespoons, who are we kidding? I want my frosting with some luxury and less sugar in it. Dutched cocoa you say? Yes, I decided to maverick it out by using our favorite Valrhona instead of the called for natural product. This was the first time I made a virgin attempt at a baking recipe by not following the recipe. As it turned out, I'm glad I took some of the risks. The cake smelled incredible out of the oven and the cocoa came through its moist crumbs. If this is what red velvet is supposed to taste like, I thought to myself, I could learn to live with the food coloring. However as my most trusted food critic also concurred, there was a slight cocoa aftertaste to the cake which may require a bit of tweaking either in the cocoa or the baking powder. As for the frosting, it took only one cup of sugar for a balanced sweetness as opposed to some crazy five-cups concoctions out there and the mascarpone made it dreamily smooth. I was excited as the cake made it to Najah's dining table, hoping to reenact that "Weeeee, I'm in cake heaven!" moment she had last year and knock her out of her socks. But alas, it was not meant to be. Apparently she had already found a better recipe than this, one that yields a visibly denser cake with a richer taste. One that's really traditional, uses three spoons of cocoa, butter instead of oil, with cooked frosting and all. Yes you Southerners, I see your point and yes, I would definitely give Magnolia's recipe a go soon - so far I've never heard a bad review on their recipes. To say that I was disappointed at failing to make the birthday girl swoon would be to put it mildly but hey, sometimes you can't win them all. At least I've discovered the red velvet in my own kitchen and actually want another piece of it now. As for you, who most likely have eaten or baked more red velvets than I, the only way to find the best one for you is to try this one out as well. Cake recipe adapted from Deb Perelman's Smitten Kitchen, originally from “The Confetti Cakes Cookbook” by Elisa Strauss via the New York Times 2/14/07. Yields 9-inch round 3 cake layers OR one 9x13 inch sheet cake and 12 cupcakes. Note: I've modified Deb's recipe for two purposes - to use Valrhona cocoa powder (Dutch processed) and to bake a sheet cake to be layered into a rectangular block cake. If you're aiming for a standard round cake and have natural cocoa on hand, hop over to the original recipe. I couldn't find buttermilk at the store (they're stocked rather slowly this part of the world) so I mixed 1 1/4 cups whole milk with 1 1/4 tablespoons vinegar and let stand for 10 minutes before using. Since Valrhona cocoa produces much darker baked results, I used a whole bottle of this (to my horror but I took consolation in the brand and 'tasteless' claim) to get the color of this cake; so you'll have to experiment with your combination of cocoa powder and food coloring. Dutch Cocoa Powder: While I did have a can of natural cocoa in my pantry, I wanted to use Valrhona for this cake. It's not that I'm a cocoa powder snob but for a friend who's a Valrhona fan herself, I wanted the best deal for her. It's possible that the recipe may not even require baking powder as it contains enough acidic components to work the baking soda but not wanting to risk a flat cake I replaced a quarter of the soda with baking powder. Feel free to try the recipe with just the baking soda. Sheet Cakes: I wanted to bake two cakes - a Swiss roll for us (or rather, just me) to savor slowly and an oblong layered cake for Najah. The rolled cake stuck to my dry tea towel as it cooled and broke when I unravelled it. At this point I'm unsure of a few things - if this recipe is suitable for a rolled cake or if using a moist tea towel and icing sugar instead of cocoa powder would help. Shall I succeed in the next attempt I'll update this section. There are other red velvet rolled cake recipes out there but I'm leaning towards the taste and texture of this one to consider a compromise, so do let me know if I'm being silly and this cake will never roll properly. In the meantime, I've modified the recipe to bake 2/3 of the cake batter into a sheet cake and the rest into cupcakes. Preheat oven to 350°F/180°C. Grease a 9x13x1 inch baking sheet or jelly roll pan and line the bottom with parchment. Line a 12-cup standard muffin tin with cupcake liners. Whisk cake flour, cocoa, baking powder and salt in a bowl. Place oil and sugar in bowl of an electric stand mixer and beat at medium speed until well-blended. Beat in eggs one at a time. With machine on low, very slowly add red food coloring. Take care, the batter may splash. Add in the vanilla. Add the flour mixture alternately with buttermilk in two batches (starting and ending with the flour). Scrape down bowl and beat just long enough to combine. Place the baking soda in a small bowl, stir in vinegar and add immediately to batter with machine running. Beat for 10 seconds. Adapted barely from Joy of Baking. 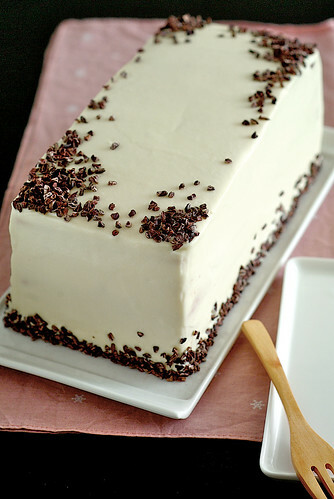 Note: This recipe was just enough to ice the three layered 8x12 inch cake you see here, spare a couple of tablespoons. To frost the original three layered 9-inch round cake or this cake plus the 12 cupcakes you'll need to double the recipe. The next time I do this I may just replace all the cream cheese with mascarpone. As this is a whipped cream frosting, if you, like me, live in a place blessed with natural sauna weather, fridge the frosting overnight to thicken before using to make your icing process free of traumatic meltdowns. In the bowl of your electric stand mixer or with a hand mixer, at medium speed beat the cream cheese and mascarpone cheese until smooth. Add in the vanilla and icing sugar and beat until smooth. Using the whisk attachment, gradually add in the heavy cream and whip at increasing speed until the frosting is thick enough to spread. Be careful not to overwhip or you'll end up with mascarpone butter. If necessary, add more sugar or cream as needed to get the right consistency. Chill to thicken before using. To assemble the cake, remove the layers from the freezer and frost each layers with about 4 tablespoons of cream in between each layer. 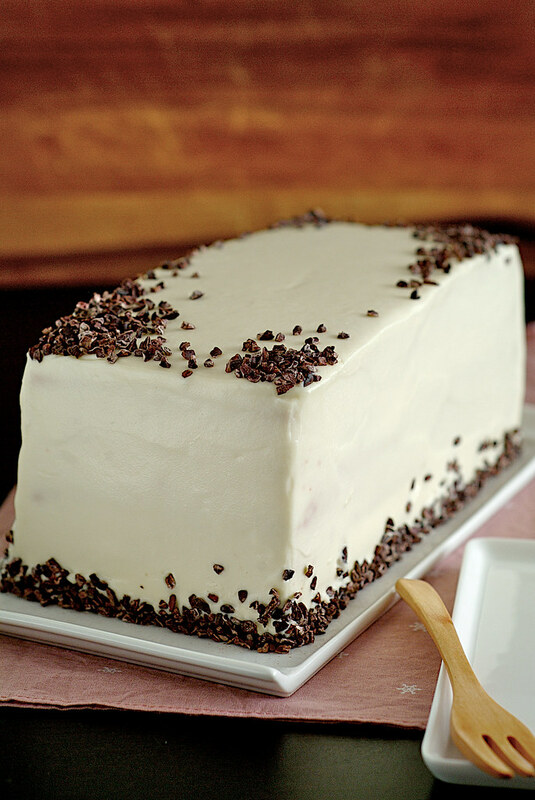 Spread a thin layer of frosting over the entire cake with a crumb coat and freeze uncovered for 45 minutes to an hour. Repeat with a second crumb coat if necessary before frosting the final coating. Ice the cupcakes with the rest of the frosting. 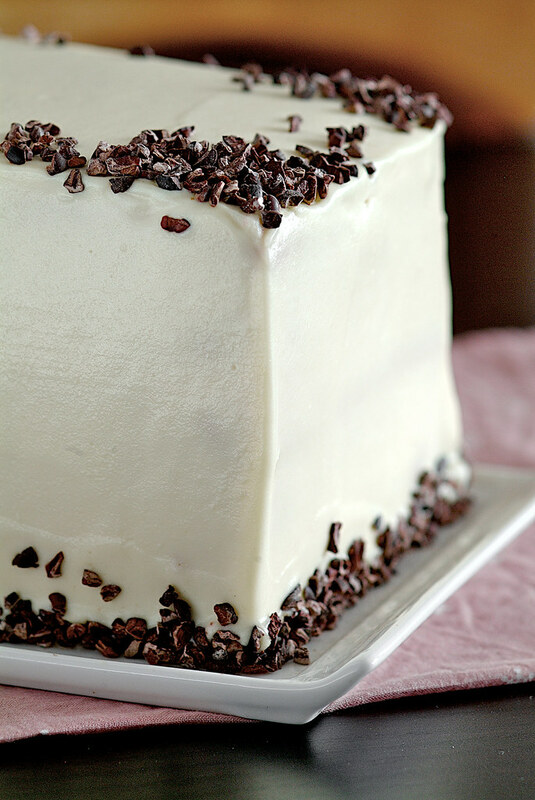 Decorate accordingly, I used some cocoa nibs on the sides and top of this cake. I find that refrigerating the frosted cake overnight keeps the frosting stable at room temperature for many hours when the cake was served the next day. Cakes keeps covered and chilled for up to 3 days. Pickyin, the cake looks good. To be honest, I myself haven't eaten red velvet cake before, not even when I was in the States (well, I was in the Upper Midwest for the most part, so ...). The red coloring puts me off from trying this cake. I think, even with the natural reaction (baking cocoa + baking soda? beet juices? ), the cake wouldn't be able to achieve this redness without coloring gel and whatnot. That's why I haven't even planned on making it. Well, I'm sure Najah is appreciative of what you'd made for her birthday, even when she has a better recipe for the same cake. It's the heart that counts oftentimes. P.S. 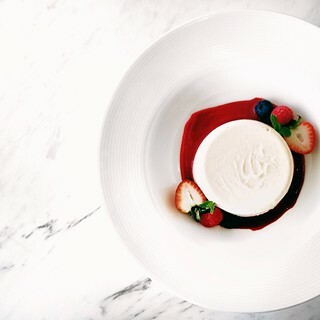 Mascarpone makes all this even more luxurious! Is it expensive in Singapore? Thanks Pei Lin for your compliments. I wouldn't have baked this if not for my friend. I must say though if we make it ourself just to eat at home, we can use less or no coloring. The cake itself is quite pleasant and velvety (no pun here, I was quite surprised as I finished a whole slice). 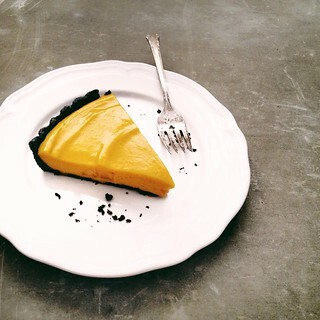 Mascarpone is not expensive by SG dollar standard and I only ever use it when baking. However I know how it can be expensive in KL. It's good to add into whipped cream too. Lisa: What frosting did you use? Cuppies require some piping work, not all frosting pipes well. Try sturdier ones to maintain shape. Lisa: Swiss meringue buttercream pipes well for me. Lisa: If you want a tried and tested recipe, I used this one to pipe on my root beer float cupcakes recently. i have a confession: i don't like oddly colored food, or foods that require any amount of food coloring. having said that, i have made numerous red velvet cakes (turned into cake pops) AND a blue velvet cake in the last year. and i never ate them. i always had taste testers. i cannot bring myself to eat them. type of cake aside, i am in love love love love with the shape of your concoction and how you decorated it. beautiful. Beautiful cake! This is one of my hub's favourite cake. I made this last year for a family gathering and all the aunts went "oh my, it must be loaded with colouring!" and refused to eat it :P I've seen recipes that use beet juice, have to try that next time. Lan: I would eat a small amount of coloring i.e. lightly colored buttercream or cake icing, but not weird and heavily colored stuffs like a blue cookie monster fondant cake etc. Even then I'd discard the colored frosting and just eat the cake. I wonder if using beets in a methodical way can achieve a similar color. Thank you for your compliments, I was aiming for a more sophisticated piped deco but alas, it was midnight and I didn't have enough time to chill the frosting further. Ann: Thanks! I know many people who won't eat this. If baking for myself I'd skip the coloring. Do let me know if you do it with beets! 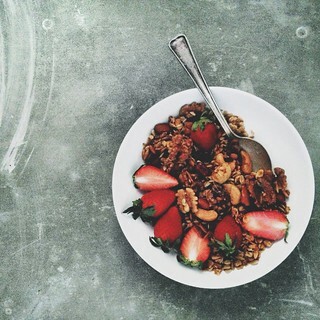 what are those that you'd sprinkled over the top and on the sides? Jasmine: Do try it, without the food coloring if you wish. It is a good cake and deserves some credit and all the hoopla surrounding it. Alan: You and I both, which is why I'm not into making macarons and the first macaron I attempted was chocolate. The cake was decorated with some cacao nibs as I couldn't chill my frosting long enough into piping consistency. Oo, this looks gorgeous! 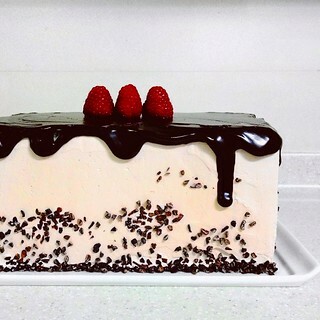 I like how you decorated it, with cocoa nibs. I think the cream cheese frosting sounds better than the cooked (based on cooked frostings I've had in the past), but I'm not a Southerner. We're most likely anti-food coloring because it "automatically" falls into the chemical additives category... But good news, there are plant-based natural food coloring available on the market and they are absolutely safe. 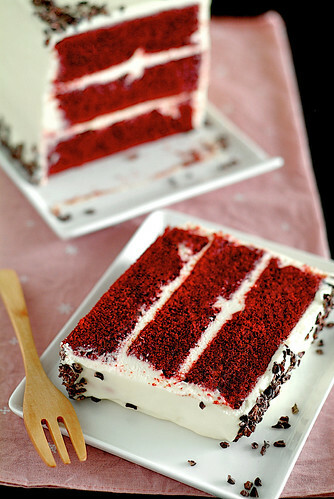 If you would know how much food coloring is in your daily food - and that includes your french fries, macaron (like Alan said) soft drinks, canned food, margarine, yogurt, ice cream and so so many more; then, I guess there is no need to snob such a beautiful cake like the red velvet! indie.tea: Thank you! I've not eaten cooked frosting myself but I think I'll prefer cream cheese frosting as well, replaced with mascarpone of course. It is harder to work with compared to cooked frosting though. Chef: I've never thought of natural food coloring! Yes we all eat some artificial food coloring at some point but it's just that when you make things at home there's a point to avoid it whenever possible. I admit the cake looks stunning when it came out and would've been disappointed if it wasn't red enough. Hope I can get some sources of natural food coloring from you. Kulsum: I'd make it with less or no coloring if it wasn't for a belated birthday but we all have to admit the nice red does make it look outstanding, especially against the whitish frosting. We'll just have to find natural ways to color it and go from there. That's too bad that this cake didn't make your friend swoon, but let me tell you, your pictures of the three layer beauty are stunning! Thanks Melanie! She swooned a bit, but last year's cake made her giddy so I couldn't top that this time. The icing is soo smooth!! Hat off to you! a WONDERFUL CAKE! Thanks Anh! The mascarpone cheese really adds to the creamny texture of the icing. 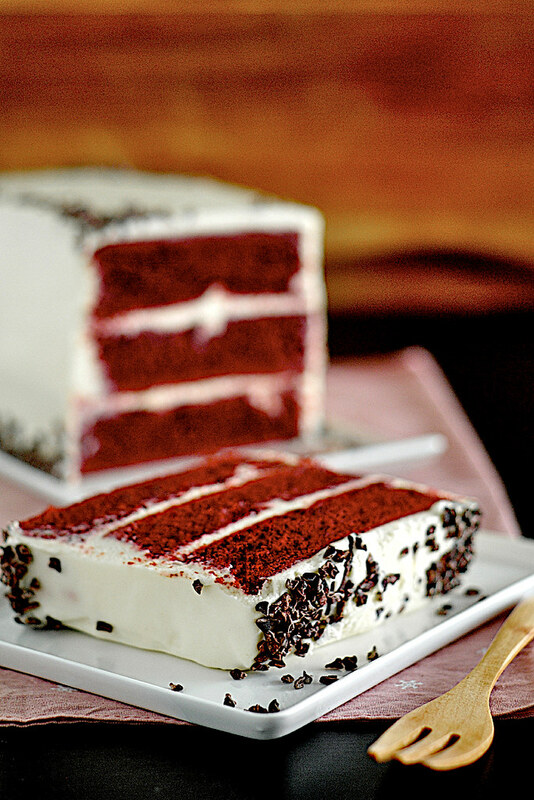 Red velvet cake is the best!! My favorite in the whole world. Just a little historical footnote here. Back when cocoa powders were first introduced they were unprocessed and that caused such cakes to have a natural red tint to them as anthocyanins in the cocoa were revealed after coming in contact with the other cake ingredients. With the advent of processed cocoas, this reaction went away. No one is sure when it became cool to add red dye to the cake, but it might initially have been a way to preserve the original color of what is essential a devil's food cake. Shaun: Hope you're making this one. Renee: Thanks for the insight. Incidentally I have read from Bravetart's piece that the red dye phenomenon may have been a result of a smart marketing ploy. Beautiful cake. Funny thing about Red Velvet ... depending on your geographic location will decide what type of icing you will use. I grew up having Waldorf Astoria Cake (Red Velvet) with the cooked "Fluffy Frosting". I moved to Indiana 3+ years ago and they expect their red velvet to have cream cheese icing :) They are both a special treat. Can't decide which I like better. You made a beautiful cake although I do not comprehend the current comeback of the red velvet cake. I grew up with them having been born & raised in the South. Even as a young child in the 70's- I thought they were just 'tacky' cakes. Also, the taste just isn't "WOW!" to me. Although the one you made with the extra dutch chocolate powder would probably make up for it. I think the cakes there- at that time-did not have the cream cheese frosting although I had tried/seen it before but cream cheese was not so standard..just white frosting. WoolieBagLady and Anon: Yes, I know cheese frosting is not traditional even before I started this cake. The cooked whipped white frosting is a bit sweet for my taste - at least the one my friend made. As for the cake's current comeback, regardless of how many would fine it tacky (including yours truly, to be honest), I think it carries with it a whiff of drama other cakes have difficulty to achieve. I haven't made this again since, and wouldn't make it for myself, unless friends want to be indulged. I just came across this on pinterest. 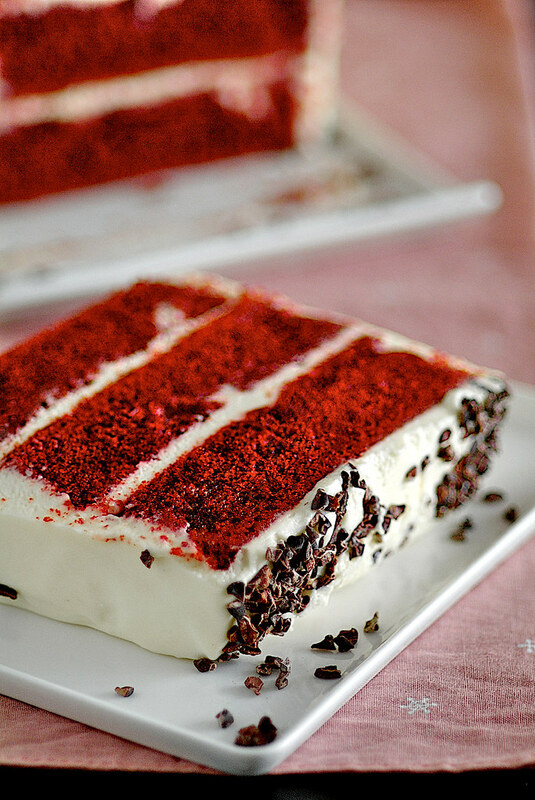 Red Velvet is my absolute favorite cake. My mother used to make this and I love the texture, the color...but one thing I do different is the frosting. I don't like cream cheese frosting on my red velvet cake. It has to be the traditional cooked kind. (any other time...cheese cake frosting is the BEST!) I am anxious to try this in the sheet pan and layer it like you have done! Such a pretty presentation!